In the last week we’ve heard the story of a tired ex serving divorce papers online to a nearly un-contactable former husband, now this week we turn the tables and discuss weddings on the internet. Sweedish do it yourself furniture giant IKEA has come up with a novel addition to it’s website, which works as a great cross-promotion tool for the products it sells. 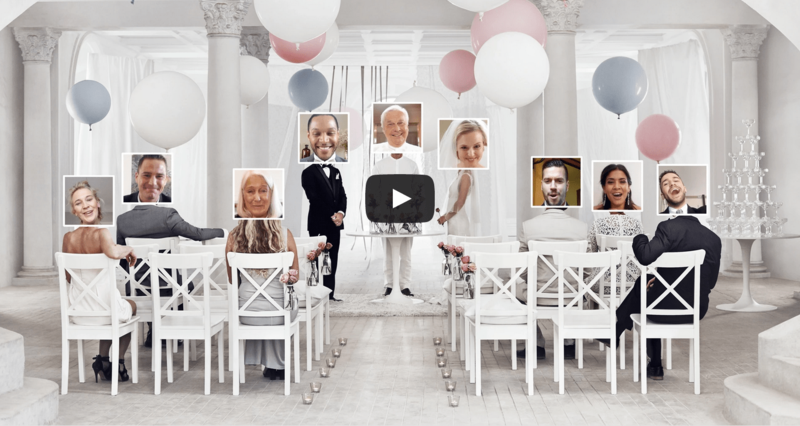 Wedding Online aims to allow you to conduct an online wedding ceremony…all you need to do is to bring the participants via Facebook and IKEA does the rest! To start the process you visit the Wedding Online portal, select the scene you wish to get married at, accept a website connection to facebook then it’s a matter of setting a date and inviting everyone. The wedding is held on the IKEA website but not publicly disclosed, leaving you the option to share it if you wish. With the use of a webcam & microphone on your computer, your head shot is superimposed on bodies in the selected scenery. IKEA assures us via their website that you can make a marriage legally binding on the service if you so wish, simply by having Bride/Groom & Celebrant in the same physical location….but the option is still there for those who want a laugh to conduct a fake marriage to test it out.